When Q4 starts, businesses are cementing plans for the upcoming year - determining what their goals are, submitting budgets and making decisions as to what projects to prioritize throughout the year. In the throes of planning, it is easy to rush through outlining a project, from pinpointing the pain points to communicating across relevant teams to properly execute. What steps does leadership need to take support a project successfully? 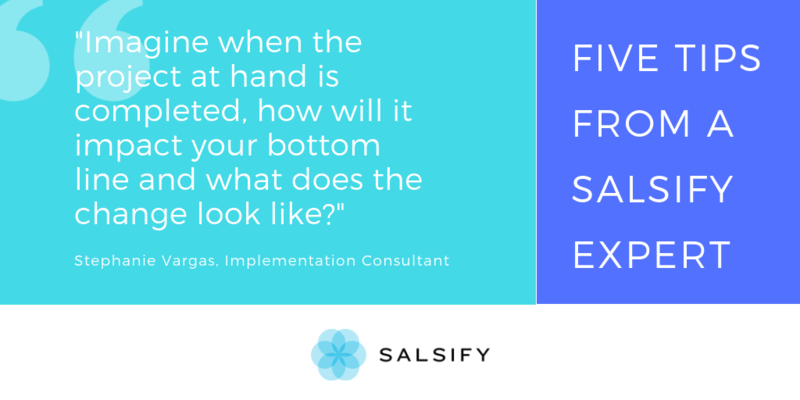 For Salsify Implementation Consultant Stephannie Vargas a central tenet of her job as a member of the Customer Success team is assist with implementing and enhancing the adoption of Salsify to fit the particular needs of brands. With over three and a half years of experience on the team, Stephannie’s expertise in project execution has helped dozens of brands. We looked to her understand what it takes to support a project, like the integration with a source system to drive your website or digital shelf presence, to successful completion. What is the actual pain point or challenge occurring today? In the case of integrating a source system, what is inhibiting the process of managing, uploading, and centralizing of the data? Brands need to consider whether the root of the problem is: Process, People or Technology. We see situations where it’s all three or just a process challenge. Defining the root of the problem will allow a project to be properly defined -- and ensure that the plan to execute will eradicate the pain point, rather than being a band aid. Be honest: what will it take to fix the problem? Do you need to hire new talent? Overhaul existing technology? It’s imperative for organizations to ask themselves what is needed for successful completion of a project. What needs to be included? What about the challenges outlined need to be changed and how do you envision that? I always ask customers to imagine when the project at hand is completed, how will it impact your bottom line and what does the change look like? As its core, this is the process of understanding what needs to be included and supposed to be built and why we’re building it. When gathering requirements, you should be focusing on and listening to what your stakeholders need. Even if they won’t be the decision-makers, you need their buy-in to have a successful project. Don’t make or rely on assumptions about requirements! This will allow your teams to easily remain focused on the end result, in addition to understanding what the change looks like. Too often do companies pick project leads and teams before defining the project and goal, and this can be detrimental to the success of the project. Identify the skill sets that align with the requirements of the project and ensure those team members who have them can commit to it--if a project is critical to your bottom line and a team member needs to be 100% focused on that project, be realistic about what they can accomplish if they have competing responsibilities. The project lead and their team need to have the time, resources and full understanding of the goals to execute effectively and within the timeline. It can be a domino effect if you don’t set it up properly at the beginning, teams will fall behind. Step 5: Communicate. Communicate. Communicate. Once you have steps one through 4 set, you are ready to move forward to execution. At this stage you must ensure project teams -- internal and external -- are aligned and understand responsibilities, priorities, and timelines. Communication is crucial to visibility and timelines. We tend to share a balance of responsibilities with the customer when co-managing projects. It’s critical for both sides to be accountable for their role -- that way we can keep it moving and ensure successful project. Once a project is complete, it’s not a check box on a to-do list that is “one and done.” Brands should be examining adoption and usability, how did it impact the end user? What was the true impact to the teams who were supposed to benefit on a day to to day basis from the project? I always recommend checking in and analyzing over time -- review over a period of two to three months and use it as an opportunity to learn and iterate if possible.